A multitalented actor Dhanush's upcoming movie Velai Illa Patathaari Part2 which is directed by Soundarya Rajinikanth. This is the sequential version of Velai Illa Pattathaari. This VIP2 release date already announced and the date was mentioned like July 28, 2017. So Fan's of Dhanush are waiting to celebrate his favorite hero's movie release. 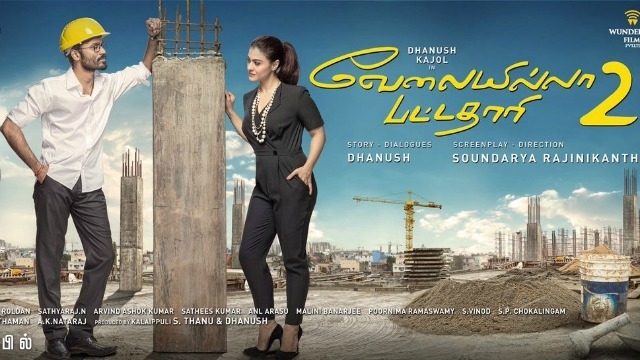 A shocking news is that VIP2 movie release date postponed and date is not to be locked. Yes, The producer of the Velai Illa Pattathaari 2 is Kalaipuli S Thaanu. he is producing under his Banner name Of 'V Creations'. Also, Producer said like Movie will be released later date in an August month due to the unavoidable reasons. VIP2 Movie musical part handled by Dhanush's favorite musician Sean Roldan, Dhanush himself written story and screenplay for this movie. Dhanush playing the same role of Raghuvaran. Kajol, Amala Paul, Samuthirakani, Saranya Ponvannan, and Vivek are doing an important role in this movie. SameerThahir handled camera part, Prasanna GK is the editor of this film. Write & Share about "Shocking News for Dhanush Fans? - VIP2 | Velaiilla Pattadhari 2 (VIP 2) Tamil Movie News | Cinema Profile" !